The Residence Inn Largo Capital Beltway Hotel is conveniently located in the DC Metro Area, less than 10 miles from Washington, DC and 15 miles from National Harbor. Situated near a variety of shopping, dining, and entertainment options, including FedEx Field, Tanger Outlets, Andrews Air Force Base, Prince George's Show Place Arena - Equestrian Center, and Prince George's Sports Complex. Our hotel is conveniently located off I-95/I-495, just a short walk from the Woodmore Town Center and Largo Towne Center DC Metro Station, providing easy access to Washington, DC and the National Mall via the Blue and Silver lines. Enjoy a great start to your day in our all suite hotel with a deluxe hot complimentary breakfast. Our extended stay hotel is designed for guests to stretch out and relax in suites that offer separate sleeping, living, and dining areas. 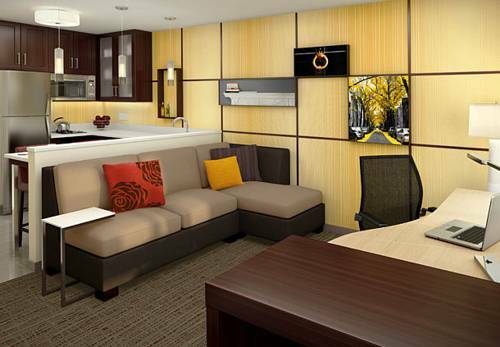 Every suite offers the comforts of home with a fully equipped kitchen, single pullout sofa bed, a spacious work space, and complimentary high-speed Internet access.